One month ago at NHKA Race #8 (the second of a two-race weekend) I won in World Formula Lights. It took 28 NHKA and X1 points races from this season and last to accomplish this. You want competition, try this class out. The day before, in Race #7, I had a rough time and crashed out early. Considering I was wiped out of energy from a little health battle I got going, I almost packed it in for the weekend. I had many offers of help and karts to use. Eventually I bought a used one at the track and set it up for the next day’s race. Thanks to all who helped or offered anything that they had. Much respect. That is the NHKA in a nutshell. I haven’t posted anything about the win because when I got home I wasn’t sure if I was going be back. My energy level was so low I had trouble talking. 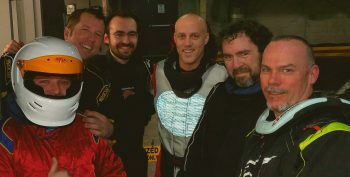 I’ve gotten better and after testing myself at a charity karting event last weekend I feel I can get the job done. I’ll be back and looking for as many points as I can get in the last two races. I look forward to tomorrow. As fiercely competitive and driven as Danzilla was on the track, he was kind and reserved off the track. Whether you were young or old, direct competition or a new driver trying to figure things out, you could count on him to help anyway he could. Right at the end of the season, he put a new karter behind the wheel and infused him with the enthusiasm to be an instant regular. 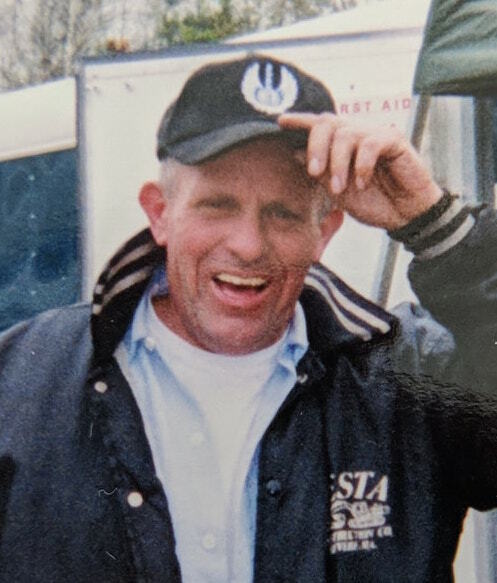 Dan loved this sport and club so much that not having somebody to hop into his seat and experience the joy of racing was an unspeakable impossibility. In some way, everyone has felt the cold touch of cancer in their lives. 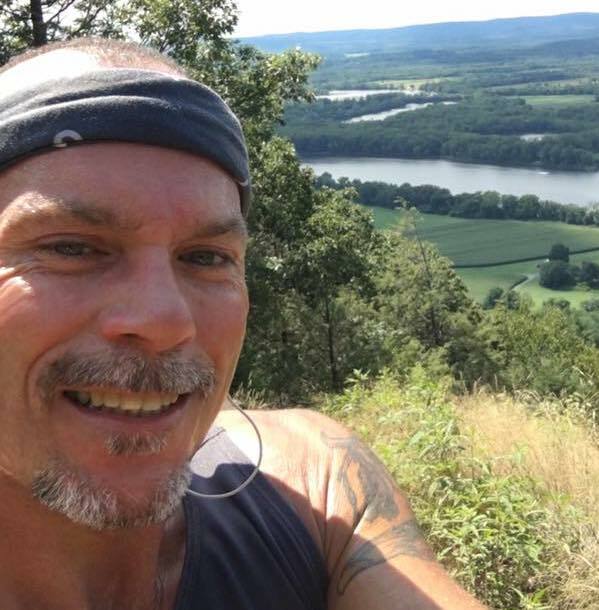 Sadly, just this past year, Dan was only one of several people in the NHKA community to endure this terrible disease, and the third it stole from us. 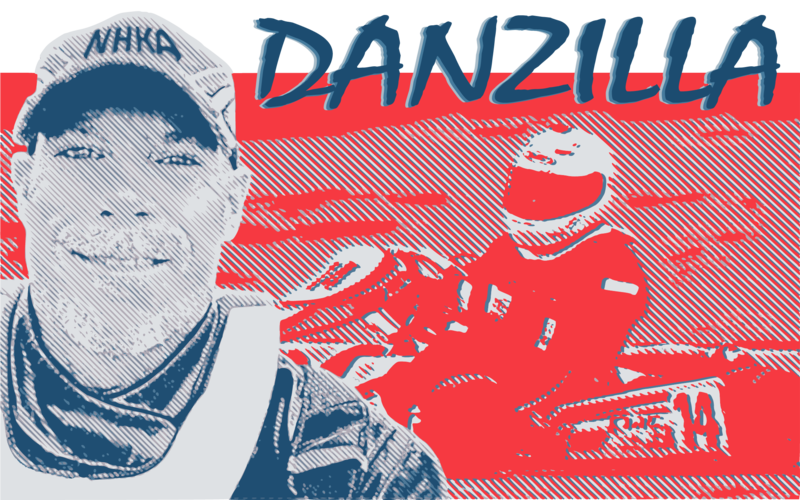 Nonetheless it was Dan’s fight that the NHKA family rallied around, inspiring a stunning outpouring of emotion and generosity at last year’s banquet. It felt as if everyone spontaneously released all the pain, sorrow, fear and emptiness cancer has forced each of us to carry. And miraculously, it was transformed into hope then presented to Dan in the form of thousands of dollars to fight his fight and live his life. He seemed to understand on some level that he was being provided with the means to fight and live on not just for himself, but on behalf of all our loved ones who no longer could. Wow, did he ever! He worked, learned and raced like a man building up to a future championship rather than a man robbed of his future and his championship. Dan wasn’t bitter. He was grateful beyond words to all of you for making it possible for him to continue to live his life and use every minute he had to pursue his dreams. Dan was an inspiration. 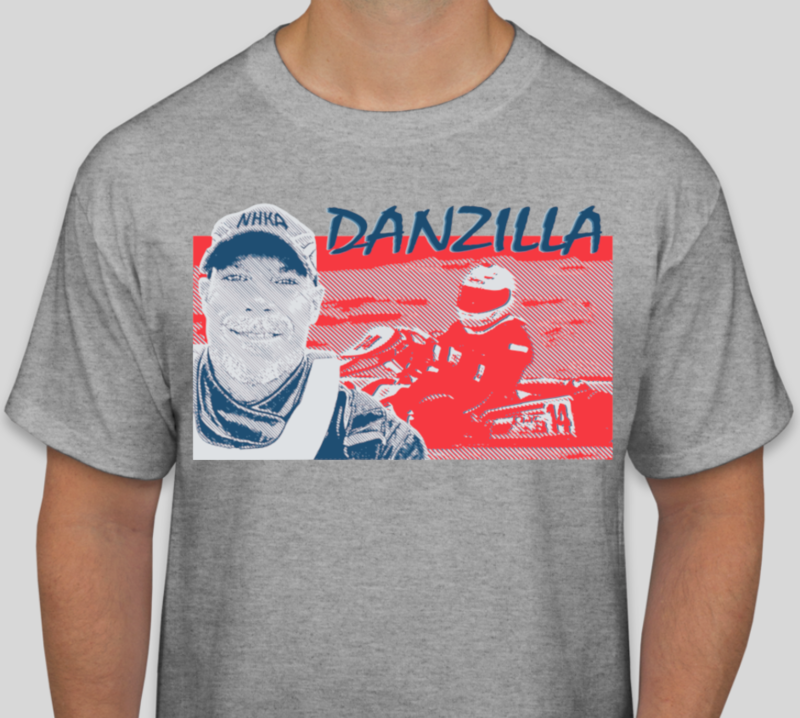 We are all very saddened by the thought of not seeing Danzilla at the track. However, the way he lived his life with so much purpose despite his illness will continue to inspire us for years to come. He wished everyone could feel the power of an entire community’s love and support the way he did. He believed it was important to experience the joy and satisfaction of being able to live every day in pursuit of their passions. He wanted doctors and researchers to have unlimited means to cure cancer so everyone has a chance live to see their dreams come to fruition. Lee, Mike and the team would like to wish the entire NHKA family a very merry Christmas and the happiest of New Years. We are looking forward to seeing all of you at the banquet, so be sure to RSVP by New Years Eve! The Best Way to Wrap-Up a Great Year of Racing – More Racing!!! The 2018 NHKA Racing Series was a huge success. We substantially upped our average entry count and set a new record for the most entries for a one-day event. There were first time winners, first time champions, repeat champions, and lots of new drivers, who mostly came back for more. Of course we also had some controversy, crashes, off-track excursions, scale line ” disagreements ” and midday drivers meetings. But it’d hardly be racing without all of those things. So more than anything, we could not be more proud of our sponsors, drivers, staff, volunteers, members, vendors, shops and families for making the NHKA what it is today. A huge thanks to NHMS and CMC for giving us great places to race, and to Jim Slade for the help with the 2018 Championship Points which are now final and posted here. We are working on the 2019 schedule and should have it ready in the next few weeks. Most of the day will be practice, with races later in the afternoon. It’s the perfect opportunity to bring a friend who wants to karting, or a driver from another class who wants to try World Formula. 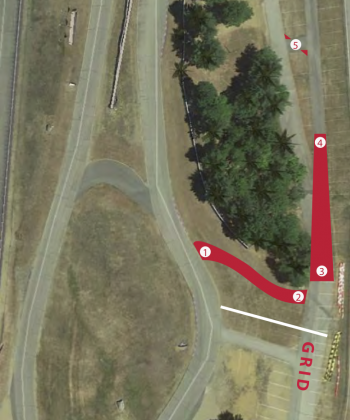 There is limited paddock space near the kart track, so larger trailers will be parked in a different location and all racers should be prepared to work from a canopy. 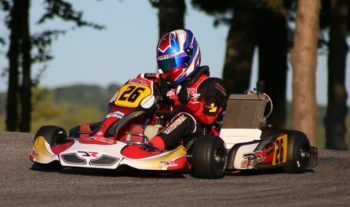 Sadly, karting recently lost one of its best friends. 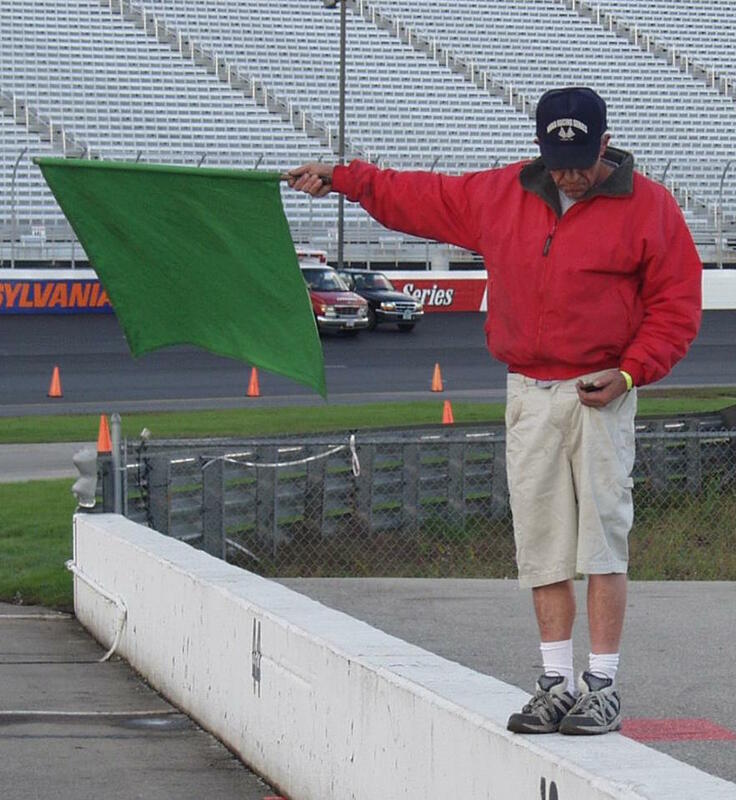 George Smith was the NHKA’s starter back when we ran the full road course at NHMS. We’ll be marking his passing and honoring his memory Saturday morning at Canaan. I met George when he and Angelo put together my first kart ten years ago. I didn’t know George very well or very long. I was just getting into karting as he was heading out. But in true George style, he took a moment to hold the door for me and welcome me with a few laughs. I loved going to that kart shop, and not just because it was net door to a Dairy Queen. First off, George and Angelo together were a riot! They’d totally play off each other to take the stuffing out of anyone for the slightest little anything. Angelo would toss some topic out there, then George would stop dead in his tracks with an expression of mock disbelief. Then, with a deep roll of his eyes and an “here we go!,” he’d take off his ever-present hat to wipe his forehead and face of the make-believe sweat caused by the steaming pile of stupid that had been dumped at his feet. 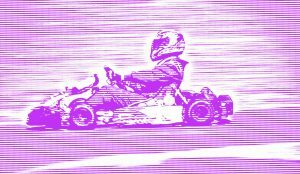 The main reason I loved going to the shop was for how much I learned about working on my kart. The last mechanical thing I had learned was how to hold a flashlight for my dad, which judging by all the yelling, I never mastered. So to me, George and Angelo were like a couple magicians exiled to the dusty clutter of that Quincy garage for showing everyone how to do all the tricks. When I say I was an odd fit in racing, what I’m trying to get across is that if a prairie dog wearing a helmet walked through the door of the shop it would have seemed less out of place than me. But George and Angelo needed only a couple cautious sniffs to accept this weird, arty, baby-toting, firehose of questions. Not only did they make me feel like I belonged, they made me feel like I always had – a long-lost friend who they needed to catch up on all the hilarious idiocy that had transpired while I was away. More than make me feel I belonged at the shop, they made me feel I belonged in the sport. When their help enabled me to have some early success, they must have talked me up in the pits. I didn’t see or hear this, but as I met new people at the track, they’d often say, “Angelo and George were telling me about you.” Given the previously mentioned prairie dog problem, this was big. You see, at the time, I thought I had started racing because, well, I wanted to race. Later I realized what I actually needed was a community. Their vouching for me paved the way. At first I chalked up his presence to a helpful nature and love of racing. But something else emerged as I pieced together his backstory. 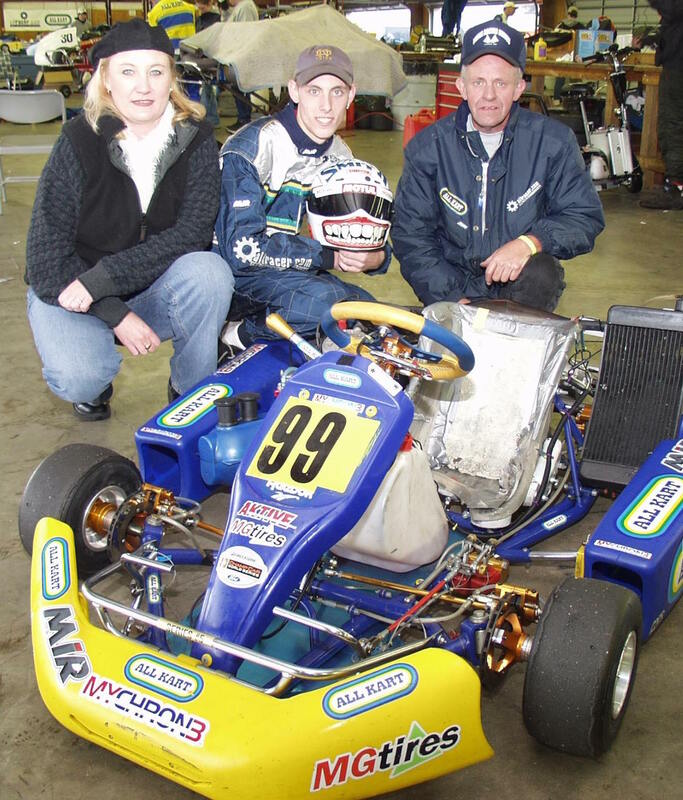 George put his son Mike into a kart for the first time when he was about nine years old. They worked at it, improved and had lots of fun together. They ran well, moved up the ladder, kept working and kept improving. They joined up with Angelo’s team and hit the road, racing at tracks like Daytona, Mid-Ohio and Road America, maybe even allowed themselves to dream “the dream.” By the time Mike reached his twenties, it was clear that fabled paid ride to the big show wasn’t going to materialize, just like it hadn’t for so many other talented racers. Suddenly a Saturday night hanging out at home with friends seemed like a lot more fun to Mike than another 22-hour haul out to some track in Indiana. And just like that, it was done. I don’t think George stuck around in karting because he was lost, bored or nostalgic. I think he was grateful for all the time, adventures and memories the sport gave him with Mike. Racing for so long at the upper levels forges a unique father/son connection that only comes from years of close collaboration in an intense environment. I’m sure George considered those years the best of his life. So I believe he stuck around karting because it was important to him that other dads and kids got to have this incredible shared experience too. This gratitude and generosity – a compulsion to pass along what karting gave to you – is the beating heart that keeps fresh blood pumping through the sport. I see it all the time, expressed in lots of different ways. It’s my favorite thing about the sport, and it was George who showed it to me first. Which is why for me, George Smith is karting. 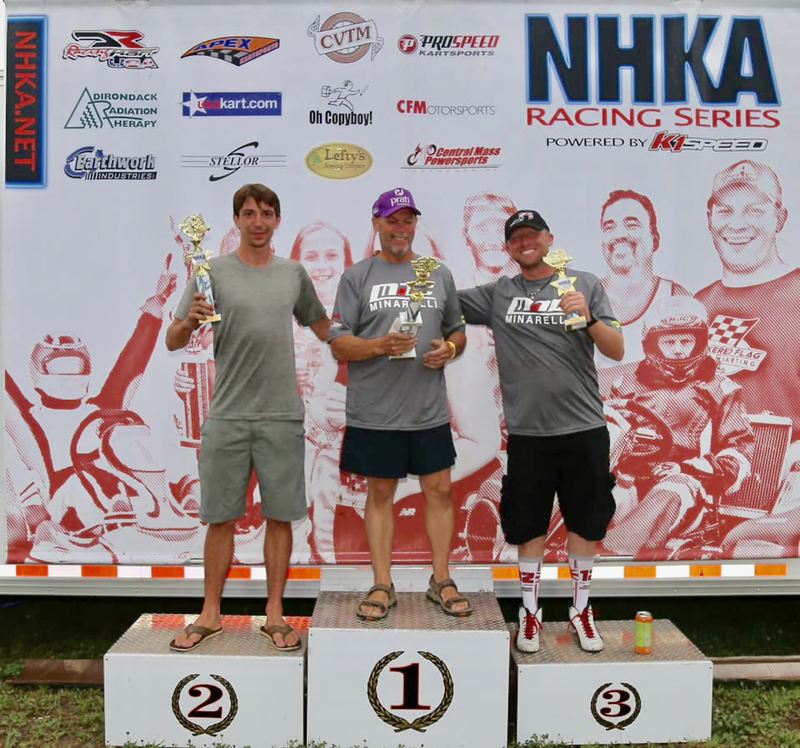 It’s hard to believe we’re only days away from the last event of the 2018 NHKA Racing Series – Saturday, October 6th at Canaan Motor Club. (Click here to make sure you get your pre-registration in before midnight October 3rd!) Wow, what a season it has been. By the time we hand out the RJT Karting sponsored trophies at the end of the day, we’ll know who the champions are, and they’ll know they pulled it off in a season like no other. This year it felt like every knob got turned up a few notches. Attendance was amazing, with 100+ entry events becoming NHKA’s new normal. And rather than diluting the level of competition, it pushed it through the roof. Sure, the usual standouts continued to dominate the top step of the podium, but instead of there being just three or four drivers with a legitimate shot at the win, now in some classes there might be twice that many. 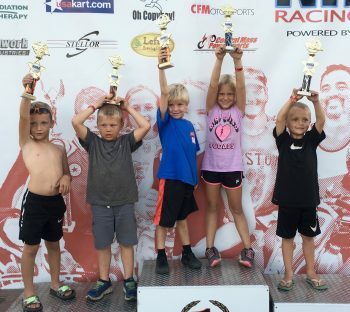 Further evidence of how high NHKA racers have elevated their game, is how long it’s been since we’ve heard the word “hooligans.” Serious on-track incidents and one-kart wrecks are rarer. The same can be said for breakdowns. You guys are getting very, very good at this. 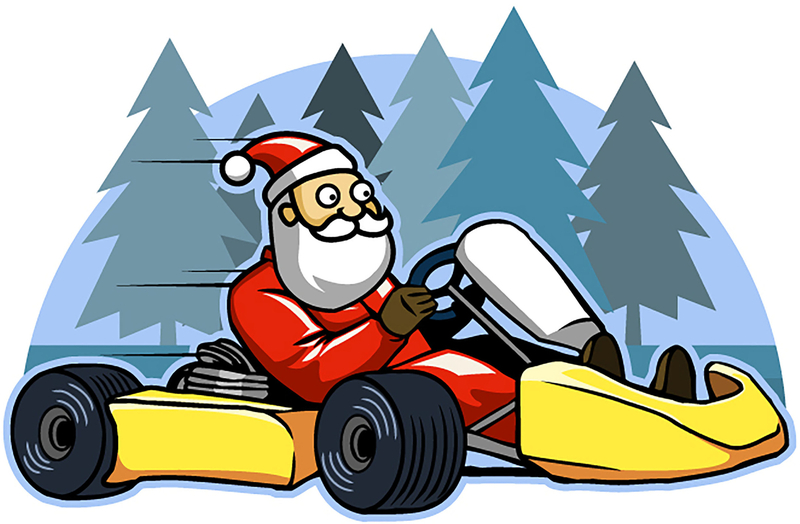 That means in addition to being the most generous, friendly and sportsman-like club in karting, this season you’ve also grown into some of the best drivers and mechanics. Even if you’re not called out below, based on what we’re seeing on track, you’ve made big gains this season you should be proud of. So what there’s no championship to battle over, or that nobody is keeping (official) track of finishing positions? Race after race this growing pack of little speed demons goes out there and gives it their all. Then there’s their families who make sacrifices, meet challenges and get greasier than any soccer mom ever has in her worst nightmare. Does this make the Kid Karts a race to watch? Damn right it does! So if you can tear yourself away a few minutes, let’s give them a cheering-on they’ll always remember! With five wins, only one finish off the podium, and a 65-point lead going into Canaan, Caleb Jarvis-Comi has set sail to his second Cadet championship in a row. Another sure thing is that Myles Danoff and Zachary Fasset will also be on the championship podium. But because after nine races they are tied in points, it be fun to watch them sort out who stands on which step. Ever hear the expression “winning isn’t everything?” With a 27-point lead, Wyatt Jarvis-Comi could come away from Canaan with the championship, but what he probably really wants is his first win of the season. Nipping at his heels is Christian Flagg, and only 18 points behind him is Alessandro Boas, who has the momentum of a win and a 2nd coming into the finale. Every greyhound race is won by a rabbit. Briggs 206 Senior champ Mike Oliver and Masters champ Alan Morrison played the part well in 2018, helping to drive growth in the Briggs 206 adult classes by giving everyone someone fast to chase. Pssst… keep an eye on Briggs 206 Senior drivers Jake Emory and Robert Bone. There’s only 30 points between them for 2nd place. Valentin Andrieux attended eight races and won all but one, in which he finished 2nd to DRT teammate Evan Slater. Not too shabby for his second season racing, oui? Veteran TaG racer Pat Dennehy nailed down the championship with a solid four wins and three 2nd-place finishes. His rival, and reigning TaG Sr. and Masters champion, Ricardo Nunes, finds himself second in the championship race with a scant five-points separating him from Huge North, who has really come into his own this season. If you like cheering for the underdog, this is the race to watch. Seven freakin’ wins! That’s how Ricardo Nunes has won his second championship in a row in one of our most competitive classes. Kevin Tibbetts kept him honest with four 2nd-place finishes. But Jim Hendrix and Brad Danoff are the race to watch. They go into Canaan in a dead heat for third in the points. No telling who’ll come out on top Saturday, but I can tell you who’ll be watching these cagey racers settle it. With six wins and a 50-point lock on the championship, if you think 2018 was a breeze for the 2017 NHKA and IKS Stock Moto Champion Keith Buffo, you haven’t watched a World Formula Heavies race this year, and you really should. Each race has been more intense than the last, filled with contact, controversy and wheel-to-wheel racing. 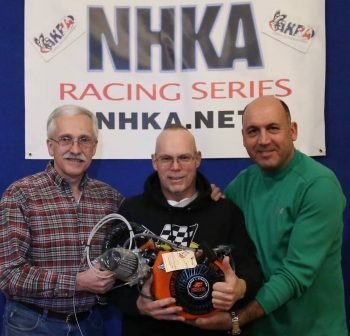 It’s a bit like the Tonight Show of the NHKA with all the celebrity guests… last season’s champion Geoff Lockett, former champ Tom Prioli, race director Mike Camarra, TaG Masters master Jim Slade, lightweight standouts Dave Nadeau and Rick Brown – all with nothing to lose but the race. It’s been wild! Don’t miss the last episode! How competitive is this class? More than 40 people raced it in 2018, including a former professional driver, a few national champions, several multi-time NHKA and IKS champions. Rick Brown only won one race this season, but he has a 40-point cushion, which should be plenty to win the championship. 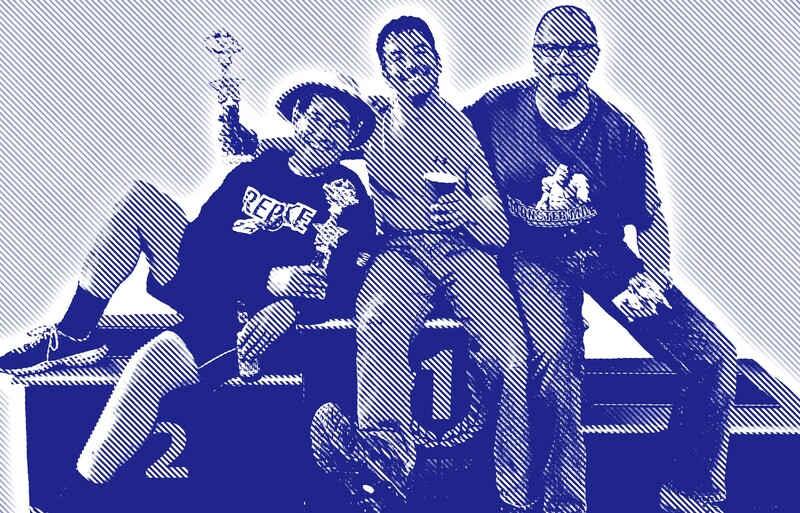 Dave Nadeau sits in second place with no wins – talk about Dammit. That’s how competitive this class is. 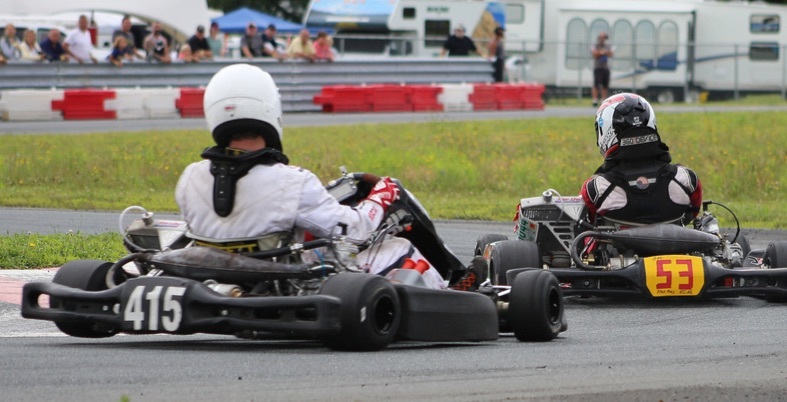 Then there’s Michael “Quiet Hands” Antonov with his eleven year old shifter chassis and a firm hold on third. So, with nothing on the line Saturday, is it still a race to watch? Are you kidding?!!!!! Here’s what we know about the KZ Shifter class going into Saturday’s race: 1) John Sullivan has a beatable 25-point lead. 2) John ALWAYS keeps it pinned. 3) Zach Morrison gets faster and better every race. 4) Zach’s dad, Alan, won’t be far behind, if he’s not ahead. When Bryan Boutin made the jump from 80cc to 125cc Honda shifters, naturally there was a period of adjustment. 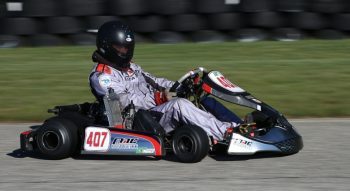 But once he got through that first half lap, he went on to win six races and the 2018 NHKA Championship. If he had stumbled, he’d have found Mike Kavanaugh and Jake Seidel ready to pounce. If you haven’t pre -registered yet, do it now by clicking here. Pre-reg is open until 5pm Wednesday August 8th. Fax and email info are on the form. You definitely want to get yours in ASAP to save $10 on every class/race you enter (including Friday Practice), and secure the best possible starting position in your races. 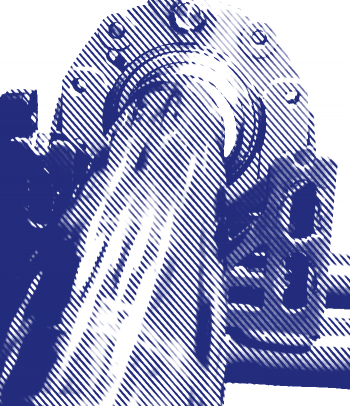 NHKA members do not need to purchase an AKRA membership. Remember, even if you pre-enter you still need to stop by registration at the track to sign the waiver and get proof of registration to display on your kart. Camping and pit passes will only be sold at the gate, cash or check only. Early entry is available Thursday night 6-10pm. Please keep in mind that the gate is locked at 10pm every night, and overnight parking is not allowed on the street or on track property outside the gate. Friday, Saturday and Sunday the gate will open at 7am. It is very important that all pit equipment and activities are kept off the pavement at all times. This is to keep the paddock roads clear for safety equipment, and to minimize damage to the asphalt. Absolutely no disposal of tires or fuel cans at the track. Seriously, do not do it. Also, please pick up all the bits of trash (butts, wire tie scraps, etc.) in yours and your neighbor’s pit area. 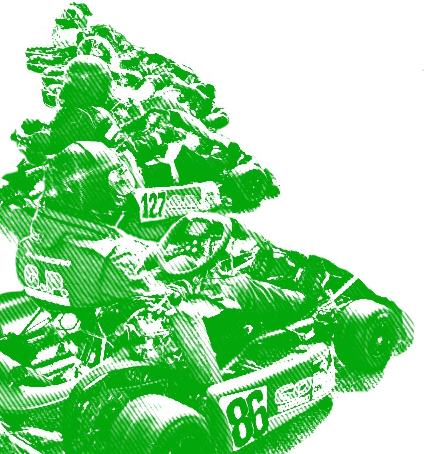 Canaan Motor Club was built and priced specifically for grassroots racers. Let’s keep it that way by not making them hire a cleanup crew by leaving the place cleaner than we found it. There will be no qualifying sessions or prefinal/heat races, only feature races. The grids for the races will be set based on the order registrations are received. There will be sign board near the pre-grid where information will be posted, such as practice and race groups, schedule adjustments, results and special announcements. There will also be an FM local broadcast of announcements and classes being summoned to the pre-grid. Kid Karts will race on the kart track. Cadets, Minis and Micros will use the sprint/half-track. All other class will race on the full road course WITHOUT the bus stop chicane. If there is passing rain, every effort will be made to dry the track and continue the day’s schedule with shortened races, if necessary. If there is sustained rain, competitors will be given the opportunity to switch over to wet setups, and we will continue the schedule on the sprint/half-track. Points: NHKA drivers will be scored separately from AKRA drivers for championship points. So, an NHKA driver who finished 2nd to an AKRA driver will get the first place NHKA championship points, and the next NHKA driver will get 2nd place NHKA points. Naturally AKRA drivers will receive AKRA points in the same manner. The AKRA Road Racing Series does not have spec tire rules. However, the NHKA does, and those and all other rules will be in effect. So if you are racing for NHKA points you must be entered in your NHKA class and race on that class’ spec tire and follow the NHKA rules just as you would at a normal club race. IT IS YOUR RESPONSIBILITY to read and know the rules. We will be measuring key components of your chassis, seat and body work. 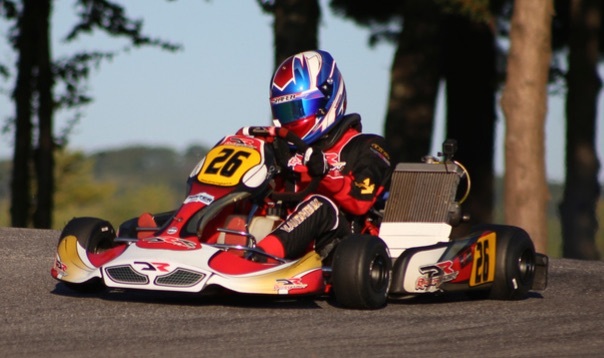 Remember that most of you use CIK body work and some of the rules are specific to those classes. Back to trophies… the rained out presentation of the Race 6 trophies sponsored by Danoff Contracting will be held this weekend. Canaan Motor Club does not sell fuel. Some of our vendors will have a limited supply of VP brand MS98 and C-12. If you are traveling to the race as an AKRA competitor whose class requires a spec fuel, and haven’t already made arrangements with a vendor to bring enough of that fuel to the track specifically for you, we recommend bringing your own. Breakfast and lunch items will be available at the track. Additionally, there are a number of casual restaurants within a mile of the track, as well as filling stations and well stocked grocery stores. There are many more dining and shopping options within a half-hour’s drive, along with plenty of hotels. For more about the track and nearby amenities check out our Canaan Motor Club page by clicking here.